The spot where the train disappeared is now lost in a tangle of long grass. The precise spot is no longer ascertainable but old railway sleepers, half buried, show where the coal trucks used to run. Yet one afternoon in the closing days of the Second World War, Ludovic Berry revealed another side to his character. It was the quality of bravery and that quality cost him his life. those years he was the driver of a steam engine nicknamed Dolly which shunted coal wagons between the May Pole Junctions and Mains Collieries. On April 30th 1945, Mr Berry was shunting wagons along the line over which he had passed hundreds of times in his working life. But that day, unknown to anyone a tragedy was imminent. A man made hazard, combined with the forces of nature were to lead to the death of Ludovic Berry in an incident which must rate as one of the most strange and horrifying ever to occur in this part of the country. Brakemen John Ward and Joseph Hindley were working with Ludi, as they called him. 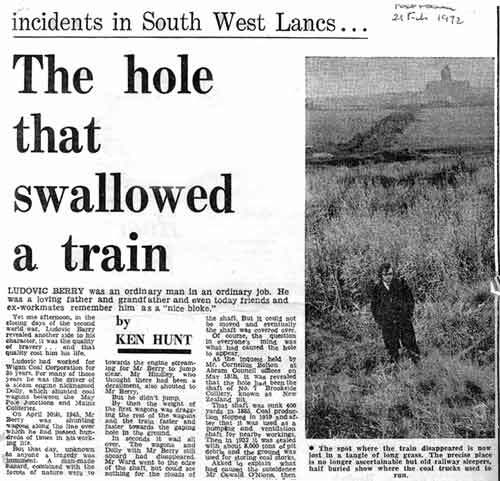 As the train moved into No8 siding pushing the 13 loaded coal trucks in front, Mr Ward who was walking along side, saw to his horror a gaping hole had opened under the rails which the first five trucks were passing. He at once signalled to Mr Berry to stop the train. Mr Ward heard the brakes being applied nit even as they were, the weight of the first trucks broke the unsupported rails and the wagons plummeted into the abyss. Mr Ward ran in horror towards the engine screaming for Mr Berry to jump clear, Mr Hindley, who thought there had been a derailment, also shouted to Mr Berry. By then the weight of the first wagons were dragging the rest of the wagons and the train faster and faster towards the gaping hole in the ground. In seconds it was all over. The wagons and Dolly, with Mr Berry still on board, had disappeared. Mr Ward went to the edge of the shaft, but could see nothing for the clouds of steam which rose and hung like a shroud over the hole in the ground which was to be Ludovic Berry’s last resting place. Mr Ward and Mr Hindley, deeply shocked went for help. But there was nothing to be done. The train and its driver were lost - for ever. A rescue operation was uppermost in the minds of everyone. Many miners volunteered to go down the hole to see if Mr Berry was still alive and if he could be rescued. But police and pit bosses ruled out any rescue attempt. The said they were sure Mr Berry would have been killed instantly and any efforts to rescue would needlessly put other lives in danger. After a few days the front of the engine could be seen pointing towards the sky from where it lay 40 yards below the rim of the shaft. But it could not be moved and eventually the shaft was covered over. Of course the question in everyone’s mind was what had caused the hole to appear. At the inquest held by Mr Cornelius Bolton at Abram Council Offices on May 18th it was revealed that the hole had been the shaft of No7 Brookside Colliery, known as New Zealand Pit. That shaft was sunk 400 yards in 1885, coal production stopped in 1919 and after that it was used as a pumping and ventilation shaft for nearby workings. Then in 1932 it was sealed with 8000 tons of pit debris and the ground was used for storing coal stocks. Asked to explain what had caused the subsidence Mr Oswald O’Nions then agent for the Junction Low Hall and Mains Collieries, said there were many factors to be considered. He had examined the shaft only the day before and nothing had appeared wrong. But he said the fact that there were so many mine workings in the vicinity, including another shaft 40 yards away, combined with heavy rains at the time, had to be taken into account. It was Mr O’Nions who said at the inquest what had been in the minds of many people. He said that Mr Berry had been a loyal worker for 35 years and loved the old engine which he drove. Mr O’Nion said he believed Berry had sacrificed his life trying to save the old engine. There were certainly no doubts in the mind of Mr Ward and Mr Hindley that there friend and workmate had stayed in the cab of the engine, holding onto the brakes until it was too late to save himself. And even now, 27 years later, men who knew Ludi voiced the same opinion.The person who suffered the biggest heart brake was Mr Berry’s only daughter, Mrs Martha Bate’s. She still lives in the same house in May Avenue, Abram, in which she and her husband, Joe, were living at the time of the tragedy.The house is next door but one to the house in which her father and mother lived for many years. Mrs Bate’s mother died only 5 months before her father was killed and their deaths came as a double blow.She told me I was only just getting over my mother’s death when I heard the news about dad. It crippled me at the time. What made it worse was that they would not even attempt to get dad out of there. They said that it was too dangerous.I had terrible nightmares at the time imagining he was still alive and struggling to get out. Even now I do not like going near the place.The spot where the train disappeared is in fact within sight of Mrs Bate’s home.Almost fatefully on the day of the incident, Mrs Bate had been taking her 11 month old baby Adrian – himself now married and a father – for a walk. She saw her father aboard the train and he waved and blew the whistle. That was the last time she ever saw him. But Mrs Bate has a small locket with a tiny picture of her mother and father inside. She cherishes this and the memory of her father, Ludovic Berry . . . a brave man.